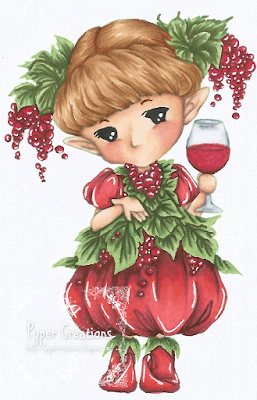 Pyper Creations: Aurora Wings Challenge #62- Anything but a Card- Wine Tag using "Wine Sprite"
Aurora Wings Challenge #62- Anything but a Card- Wine Tag using "Wine Sprite"
Hey You guys!!! I'm gonna write this up quick for you today because as you will see we have to go PPAAARRRTTTYYY!!! 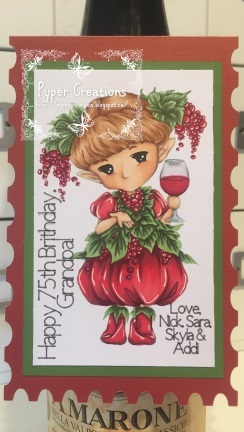 My Grandpa is 75 today so I bought him a very nice bottle of wine and put together this wine tag for him!! I used the new Wine Spite which I have been dying to have time to play with!!! Take a look!! Isn't she just sooo sweet!! I love all the little grapes Mitzi drew in here!! And lastly here you go!! All on the bottle and ready to roll!! Just like this little family!! See you all next time and thanks for stopping by!!! before I go!! Where to pick up with adorable-ness for yourself!! And make sure you stop by the Aurora Wings Challenge Blog to see everyone elses incredible work! !